Definitions of urban entities and urban typologies are changing constantly to reflect the growing physical extent of cities and their hinterlands. These include suburbs, sprawl, edge cities, gated communities, conurbations and networks of places and such transformations cause conflict between central and peripheral areas at a range of spatial scales. This book explores the role of cities, their influence and the transformations they have undertaken in the recent past. Ways in which cities regenerate, how plans change, how they are governed and how they react to the economic realities of the day are all explored. Concepts such as polycentricity are explored to highlight the fact that cities are part of wider regions and the study of urban geography in the future needs to be cognisant of changing relationships within and between cities. 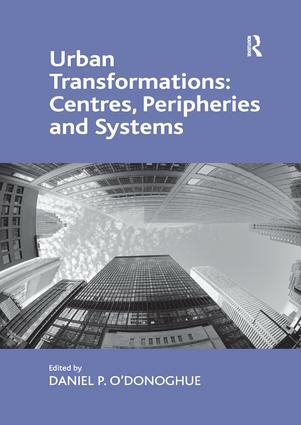 Bringing together studies from around the world at different scales, from small town to megacity, this volume captures a snapshot of some of the changes in city centres, suburbs, and the wider urban region. In doing so, it provides a deeper understanding of the evolving form and function of cities and their associated peripheral regions as well as their impact on modern twenty-first century landscapes. Contents: Foreword, Larry S. Bourne; Introduction: urban transformations: centres, peripheries and systems, Daniel P. O'Donoghue; The anatomy of urban sprawl in the Mediterranean region: case of the Girona districts, 1979-2006, Juli Valdunciel-Coll; Urban regeneration in Porto: reflections on a fragmented sub-regional space, without institutional powers and 'lost' between central government and local authorities, Pedro Chamusca; Consumption of advanced internet services in urban areas: a case study of Madrid, Ruben Camilo Lois-Gonzalez, Francisco Jose Armas-Quinta and Jose Carlos Macia-Arce; Housing market dynamics in a peripheral region: the Atlantic Urban Axis in Galicia, Spain: 2001-2010, Alejandro Lopez-Gonzalez and Maria-Jose Pineira-Mantinan; Viability of flagship projects as models of urban regeneration: the representation of space through the discourse of the actors, Jose Ignacio Vila Vazquez; Creativity beyond large metropolitan areas: challenges for intermediate cities in a globalized economy, Joan Ganau-Casas; Is Pennine England becoming more polycentric or more centripetal? An analysis of commuting flows in a transforming industrial region, 1981-2001, Tony Champion and Mike Coombes; Riots by a growing social periphery? Interpreting the 2011 urban riots in England, Wayne K.D. Davies; In the shadow of a giant: core-peripheral contrasts in South East England, Daniel P. O'Donoghue; The Fehmarnbelt Tunnel: regional development perspectives, Christian Wichmann Matthiessen; Vertical extension processes and urban restructuring in Sydney, Australia, Jun Tsutsumi; Inner-city social gentrification in Tokyo: the problem of childcare, Mikoto Kukimoto, Ryo Koizumi, Tomoko Kubo, Hiroyasu Nishiyama and Taro Kawaguchi; Power nodes: downtowns in the periphery? A case study, Toronto, Canada, Jim Simmons; Just 'dumb and boring' or 'over'? Lifecycle-trajectories, the credit crunch and the challenge of suburban regeneration in the US, Markus Hesse; Urban transformation for sustainability and social justice in urban peripheries: new forms of urban segregation in post-apartheid cities, Simphiwe Mini; Recent morphological trends in metropolitan South Africa, H.S. Geyer, H.S. Geyer Jr, D.J. du Plessis and A. van Eeden; Metropolitan transformation and polycentric structure in Mexico City: identification of urban sub-centres, 1989-2005, Adrian Guillermo Aguilar and Josefina Hernandez-Lozano; Delhi and its peripheral region: perspectives on settlement growth, Debnath Mookherjee, H.S. Geyer and Eugene Hoerauf. Index. Daniel P. O'Donoghue is at Canterbury Christ Church University, UK.